I agree about Saphir cream (the one in glass jars). It does have more pigment than most on the market, available in many shades and black as well. (02-09-2019, 02:42 AM)willyto Wrote: Seems quite extreme and looks like the finish has been stripped off. I don't see any mention of this in the boots description Simon. I would make 100% sure that people who buy the black version are aware of this details because otherwise they might be disappointed. To be fair, the description does refer to them a brown with a dusting over of black, but I'd definitely have been more explicit about this.... might be worth, even, having the photo above on the website so potential buyers can see it. It's not for me, but maybe the guys who want their leather jackets to do this might fancy matching boots (though to date I've only seen engineer boots with this aesthetic). For anybody who wants to take it back to black, I would recommend looking into the car restoration scene: my dad used to use a cream that came in a tube which both rejuvenated dried and crack seats and brought the colour up like new. A few years ago I did the same with an old bike jacket using a bottle of stuff called Black Leather Jacket - brush on, leave to dry, buff with a soft cloth, good as new. not used it on shoes, though. Edward where do you see the bolded part of your message? Genuinely asking because I don't see it. Vintage black could mean anything. Wasn't it on the original description, before the website update? I remember seeing something similar. You're right, it's not there now. I was sure I read it on the website, but maybe it was an earlier draft on the forum instead, then? I would definitely alter it at that rate. As you say, 'vintage black' could mean anything - a really good, glossy black, satin black, black that has faded to grey.... I'd also insert the word 'teacore' in here as a pull-in for the leather set who like that look. If they're ready to buy jacket that us meant to look decades old within a month or two, they might want boots to match. Toe on shoe on the left stripped of dye/paint. 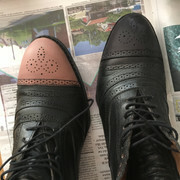 Toe on shoe on the right stripped and painted with one coat of ”narvsvärta”. About two coats of narvsvärta, added with brush. One more coat was added, but with a cloth instead (to make sure there weren’t any marks after the brush. There we go. 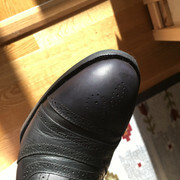 Wiped of with a wet cloth and then treated with shoepolish, looking basically like new. Btw, you know what I think fucked them up/created that worn look so fast? 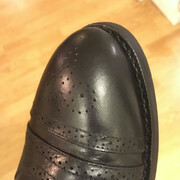 Shoe polish. Or rather, the solvent in the polish I used.